Bruschetta with Tomato and Basil: Bruschetta is an antipasto from Italy whose origin dates to at least the 15th century. It consists of grilled bread rubbed with garlic and topped with olive oil, salt and pepper. Variations may include toppings of tomato, vegetables, beans, cured meat, or cheese; the most popular recipe outside of Italy involves basil, fresh tomato, garlic and onion or mozzarella. Bruschetta is usually served as a snack or appetizer. Parboil the tomatoes for one minute in boiling water that has just been removed from the burner. Once the tomatoes are peeled, cut them in halves or quarters and remove the seeds and juice from their centers. Also cut out and discard the stem area. Turn on the oven to 450°F to preheat. While the oven is heating, chop up the tomatoes finely. Put tomatoes, garlic, 1 tbsp extra virgin olive oil and balsamic vinegar in a bowl. Slice the baguette on a diagonal about 1/2 inch thick slices. Coat one side of each slice with olive oil using a pastry brush. Place on a cooking sheet, olive oil side down. You will want to toast them in the top rack in your oven, so you may need to do these in batches depending on the size of your oven. Once the oven has reached 450°F, place a tray of bread slices in the oven on the top rack. Toast for 5-6 minutes, until the bread just begins to turn golden brown. Arrange the bread slices on a serving platter, olive oil side up. Place some topping on each slice of bread, right before serving or the bread may get soggy. Bruschetta with tomato and basil is ready to be served. Plum tomatoes are used instead of regular tomatoes because the skins are much thicker and there are fewer seeds and less juice. Traditional Method of Toasting Bruschetta: Toast the bread without coating it in olive oil first. Toast on a griddle for 1 minute on each side. Take a sharp knife and score each slice 3 times. Rub some garlic in the slices and drizzle half a teaspoon of olive oil on each slice. 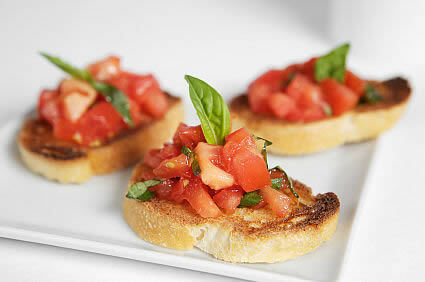 If you have any queries about this Bruschetta with Tomato and Basil Recipe , please write down in comment box below.